Glaucoma is often thought of as a single disease, but the term actually describes a group of eye conditions that cause optic damage and possible loss of vision. Usually, the damage is caused by abnormally high pressure within the eye, and glaucoma is one of the primary causes of blindness today in the United States. Open-angle glaucoma is the most common type of the disease, and it is nicknamed a "sneaky thief of vision" because generally no symptoms are present until major loss of sight occurs. Early warning signs are not typical, and the disease develops very slowly. Noticeable loss of sight may not be observed for many years. Generally, people with this type of glaucoma feel fine, and they rarely notice a visual change in the early stages because the loss is usually limited to peripheral or side vision. Visual sharpness and acuity are usually maintained until the disease progresses to later stages. Open-angle glaucoma is usually advanced by the time patients report vision loss, and unfortunately, this vision loss cannot be reversed. The second most common type of the disease is angle-closure glaucoma, which does present symptoms in earlier stages. You may notice your vision becoming blurry or hazy, suffer from severe head or eye pain, notice rainbow-colored circles appearing around bright lights, experience vomiting or nausea, or even develop sudden loss of sight. These symptoms usually present quickly and are impossible to ignore. If you are experiencing the symptoms of angle-closure glaucoma, seek care from your eye doctor as soon as possible to treat the condition and reduce the risk of further progression. If you experience symptoms suddenly, such as blurred vision, severe eye pain, or halos around lights, seek emergency care immediately because you may be experiencing an acute attack of angle-closure glaucoma. Many people wait to see an eye doctor until they are experiencing symptoms, but open-angle glaucoma may develop without any warning signs. By the time the condition is diagnosed and symptoms are present, it is often too late to reverse the damage even with surgery. 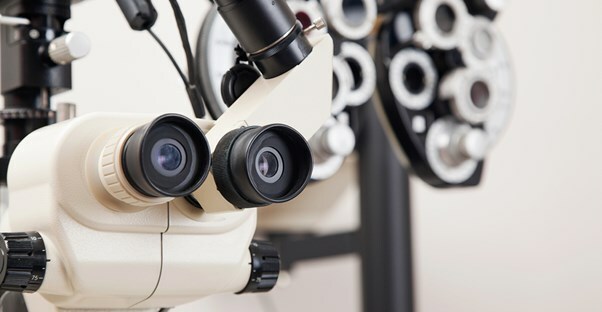 Instead of waiting for symptoms to show, you should schedule a comprehensive eye exam when you turn 40 and see your eye doctor every three years afterward. If you have risk factors for the disease, like elevated internal eye pressure, being of Africa-American descent, having a family history of glaucoma, other eye conditions, or a history of long-term corticosteroid use, you should have a glaucoma screening every two years. As you age, it becomes more important to have regular screenings, and you should see your eye doctor every year after the age of 60.